NASA photo of sample 61016, better known as "Big Muley". Lunar Sample 61016, better known as "Big Muley", is a lunar sample discovered and collected on the Apollo 16 mission in 1972 in the Descartes Highlands, on the rim of Plum crater, near Flag crater. It is the largest sample returned from the Moon as part of the Apollo program. The rock, an 11.7 kg (26 lb) breccia consisting mainly of shocked anorthosite attached to a fragment of troctolitic "melt rock", is named after Bill Muehlberger, the Apollo 16 field geology team leader. Big Muley is currently stored at the Lunar Sample Laboratory Facility at the Lyndon B. Johnson Space Center. TV camera still of Big Muley prior to collection. Big Muley was discovered on the eastern rim of Plum crater (Station 1) in the Descartes highlands of the Moon. 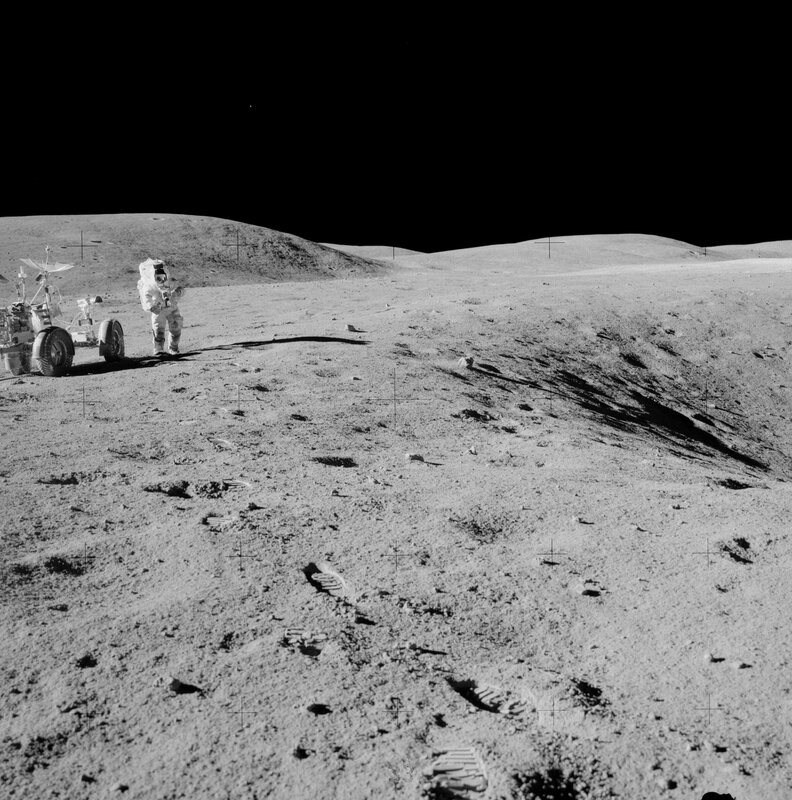 The rock's cosmic ray exposure age was discovered to be about 1.8 million years, linking it to ejecta, or debris, from the impact that formed South Ray crater, to the south of the Apollo 16 landing site. The rock's age has been estimated since 1980 to be approximately 3.97 ± 0.25 billion years. The rock was highly shocked at some point in its history, as indicated by the fact that most of the rock's plagioclase content was converted to maskelynite and/or plagioclase glass. ^ "Station 1 at Plum Crater". Apollo Lunar Surface Journal. Retrieved 4 September 2011. ^ a b c "61016" (PDF). National Aeronautics and Space Administration. Retrieved 4 September 2011. ^ "NASA 61016A". OU-NASA Virtual Microscope. Archived from the original on 2012-09-24. Retrieved 4 September 2011.